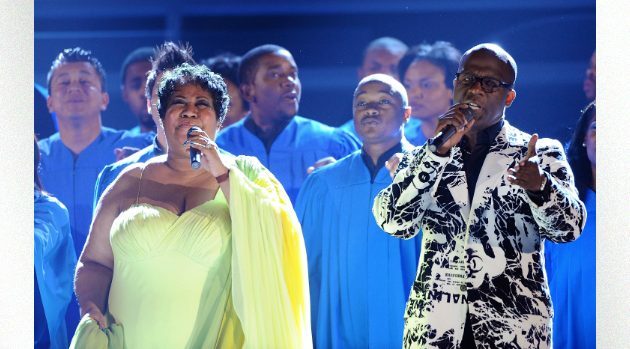 Michael Caulfield/WireImageIt’s been two months since Aretha Franklin passed away, and her longtime friend BeBe Winans has many fond memories of The Queen of Soul. Like Aretha, BeBe also grew up in Detroit, and they often recorded and performed together. BeBe remembers how Aretha always preferred working with male singers. The youngest brother of the famed Winans gospel music family began his recording career singing with his sister CeCe in 1984 before launching his solo career in 1997. He recalls a time when he and CeCe were about to record with Aretha and the Queen of Soul, true to her love of male vocalists, barely noticed his sister. “Aretha was hilarious to me. One of the things that I will never forget, me and CeCe were in Detroit and Aretha stopped by the Coney Island [hot dog stand] to pick up us all some hot dogs,” BeBe remembers. CeCe was among the artists who performed a tribute to Aretha on October 9 at the American Music Awards. BeBe has written an autobiographical musical, Born To This, which is scheduled to make its Broadway debut in the spring of 2019.